Here's a simple method you can use to add a bump map to the mi_car_paint_phen_x material without using custom shaders or complicated shading networks. 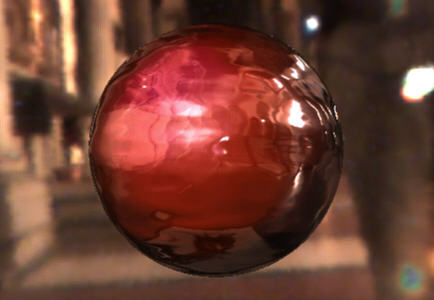 You connect bump maps to the material but the renderer is doing some sneaky stuff at the shading group level and we can use that knowledge to add bump maps to materials like the mia_car_paint_phen_x, that have no bump slot. So we start with a material that does have a bump slot. I'm using mia_material_x. Assign it to your surface and set the diffuse color, diffuse weight and reflectivity to zero. If you render now you'll get a totally black surface. 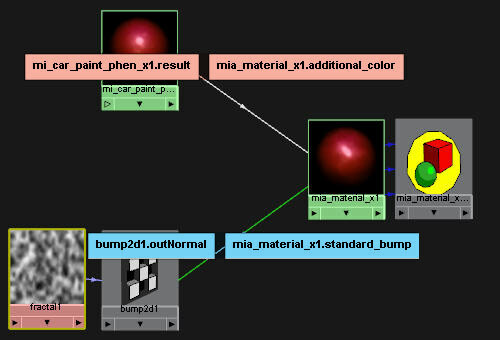 Create a mi_car_paint_phen_x material and connect it to the mia_material_x additional color slot. Unfortunately you will need to resort to the connection editor to do this. The exact connections are shown in the hypershade snapshot below. Connect a texture to the bump slot of the mia_material_x (you can drag and drop this one). I'm using a fractal as you can see in the snapshot. Thats it. When you render you'll notice that the specular highlights on the car paint (and the reflections) are perturbed by the bump as you would expect if the bump was connected directly to the car paint material.